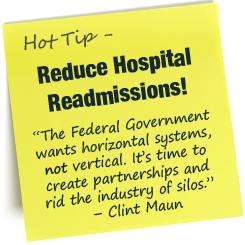 Partnerships are critical to success in the oncoming healthcare landscape. Clint Maun discusses imperative survival implications for the SNF marketplace in this recent Long-Term Living article. Check it out! Maun-Lemke is proud to announce a new joint venture with our strategic partners at COMS Interactive! Learn what Kindred, Kaiser Permanente and Catholic Health Initiatives indicate hospitals want from SNFs in this incisive white paper by Teresa Chase, President & CEO of American HealthTech, who will be speaking to our clients at the 2012 Maun-Lemke Revenue Summit. Whether we're speaking, consulting, conducting surveys or mystery shopping, our goal is to meet our customers' needs, provide strategies to overcome their 'pain' issues and elevate the quality of our profession, i.e. improving healthcare outcomes. Revenue Pain? We can cure it! Staffing and Turnover Issues? We can fix them! Low Customer Service Scores? We can improve them! As healthcare organizations change, grow and experience a more challenging marketplace, even top performers may face difficult situations in their efforts to maintain excellence. With today's present economic trends and productivity demands, Maun-Lemke can assist you in your quest. Recognizing your needs and fulfilling them is Maun-Lemke's 100% Satisfaction Guarantee. Our standard and customized programs are designed to build lasting relationships with our valued clients. If you'd like to explore developing a relationship with us, please contact us for further information and assistance. Maun-Lemke's consultants present results-oriented program for associations, company meetings, strategic retreats, workshops and keynotes. We can improve your organization's efforts in turnover reduction, employee morale improvement, communications, quality of delivery, team-building, leadership, revenue enhancement, customer service, human resources, management development, recruitment, selection and retention. Maun Lemke, LLC Copyright 2006: All Rights Reserved.